Rows of grapevines, heavy with leaves and grapes, line the side of the road as we pull into a winery’s driveway. We pause for a moment on the steps to admire the mountain views and beautiful expanse of trees. Inside, we sip Chardonnays and Cabernet Francs, spicy wines, fruity wines, and dessert wines. A taste of horseradish cheese enhances the flavor of a local red, while the vintner explains his goal for that particular vintage. Are we in California? France? Try Virginia. The Blue Ridge Wine Way is home to a consortium of 12 wineries, all located an hour to an hour and a half from Washington, D.C. In addition to wine tasting, this area offers a gateway to Shenandoah National Park and its scenic Skyline Drive. Hiking and canoeing are popular fall activities, as well as wandering through little towns and driving tree-lined backroads past farmland and gorgeous countryside. Fall is the most popular time to visit the Blue Ridge Wine Way. By mid-October, the trees have burst into vibrant reds, yellows, and oranges, and the wineries are busy with harvesting this year’s grapes. An October or early November visit offers stunning views and crowded tasting rooms. If you don’t mind passing up the best fall colors, a November getaway will promise decent weather and a more intimate wine-tasting experience. Wine tasting and leaf peeping are intricately connected in Virginia, and a weekend getaway can easily encompass both activities. The best place to view the area’s majestic colors is along the Skyline Drive, the road that runs through Shenandoah National Park. Look at a map before you go because you can only enter and exit the park at a few locations. The two entrances in this part of wine country are at Front Royal and Thornton Gap (near Sperryville). As Shenandoah is a national park, you’ll need to pay an entrance fee of $15 per vehicle ($10 from December through February). Alternately, the wineries themselves and the drives to them offer landscape views for free. The Blue Ridge Wine Way is bordered by Route 7 in the north, Route 211 in the south, and Skyline Drive to the west. In one day, we easily hit four wineries, starting with Gray Ghost in Amissville and finishing up at Fox Meadow Vineyards in Linden, hitting Rappahannock Cellars and the Oasis Winery in between. Travel distances aren’t far, so you can choose to sample wines in a wide area or focus on vineyards clustered together. If you want to visit a large number of wineries in one day, I highly recommend a designated driver. We hit three wineries before lunch, and I was woozy enough that I handed my boyfriend the car keys and instructed him to find a nearby restaurant. Or, let someone else do the driving. The Omni Shoreham Hotel and the Lansdowne Resort offer accommodations packages that include a wine tour. If you’re staying at another property or want transportation from the D.C. area, Virginia Wine Country Tours offers guided tours. A van or limo for groups of up to 10 people costs $75 to $85 per hour—not a bad deal if you can muster a large enough group. For $45 an hour, a chauffeur will drive your car and act as your personal winery host. Many of the Virginia wineries are mom-and-pop operations and not quite as large or polished as their Californian counterparts. Of the vineyards we visited, Gray Ghost has by far the best wines, but chaotic Oasis pours the biggest samples. 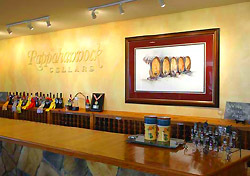 Rappahannock Cellars has the most professional tasting room, including a play area for the very-under-21 set. Fox Meadow is a new vineyard, where the owners preside over the tastings, discussing how each wine was created. Crowds varied throughout the day. At 11 a.m., Gray Ghost was practically deserted, but by 4 p.m., we had to wait for a spot to open up at Fox Meadow’s tasting bar. If you’re planning a midweek getaway, be sure to check open hours because many wineries only offer public tastings on weekends. For an education in wine production, Oasis Winery runs a public tour daily at 1 p.m. The guide is very knowledgeable, but you’ll be seeing a working factory rather than a show cellar with photogenic oak barrels. For other wineries, you’ll need to call ahead to schedule a tour. Despite claiming that October is “Virginia Wine Month,” most wineries held their special events in late September and early October. November events include a chili lunch and a Civil War authors event, and the Rappahannock Cellars has Christmastime events. Check the Web for events listings during your dates of travel. Once you’ve drunk your fill of wine, you might need a bit of fresh air. Outdoor pursuits are popular in this area, specifically hiking and canoeing. You’ll find many hiking trailheads on Skyline Drive between Front Royal and Sperryville. The Little Devils Stairs trail is a perennial favorite. Front Royal is also home base for canoe and kayak trips down the Shenandoah River. You can rent from the Downriver Canoe Company and the Front Royal Canoe Company through the end of October. I just wouldn’t recommend embarking on a physical activity immediately following your wine tour. The Blue Ridge Wine Way is peppered with B&Bs and inns, but they fill up quickly during the peak fall season. The lodging options in the town of Washington, Virginia, tend to be pricier than their counterparts in Front Royal and Warrenton. Our last-minute planning meant we spent the night in a chain hotel in Front Royal. The price was right, but the hotel did not exceed our low expectations. The location, however, couldn’t have been better. Front Royal is a great place to spend the night. It’s home to every chain restaurant imaginable, but you can find some local favorites as well. We ate dinner at the Melting Pot, a local pizza parlor with fantastic crispy crust pies. Our table was surrounded by the middle school football team and their parents mourning a tough loss with slices and subs. The historic downtown area has a movie theater, coffee shop, and some cute storefronts. A great wine-country lunch stop is the Griffin Tavern in Flint Hill, very close to Rappahannock Cellars and the Oasis Winery. We sobered up on delicious fish sandwiches before going in search of more wine. Or, many wineries sell cheese and light bites and let you picnic on their grounds. You can bring your own bag lunch, but wine must be bought on the premises. The Blue Ridge Wine Way is easily accessible from Washington’s Dulles and National airports, and slightly farther from Baltimore. Local residents can see the vineyards in a long day trip or make a weekend of it. Out-of-towners might prefer to combine a city stop in D.C. with a wine-country getaway, or spend a few nights in this area before heading south to Charlottesville and other wine regions. Even the most uppity of wine snobs must admit Virginia wine country has a lot to offer. As you sip a glass of local wine and gaze at the colorful fall countryside, you may find yourself nodding your head in agreement.